The Nashville Predators once again battled back from a 2-0 deficit en route to a 5-2 win over the Chicago Blackhawks Saturday night. With the win, the Predators secured back-to-back Central Division championships. After the first period, Nashville was down 2-0, but defenseman Dante Fabbro notched his first NHL goal at 9:07 in just his fourth pro game. While the Predators controlled most of the game while even being down, this was the spark that really got them going. Filip Forsberg netted his 28th of the season just before the second period ended to tie the game. The third period was all Predators. While on the power play, Viktor Arvidsson scored his 34th of the season, setting a new franchise record for goals scored in a single season. Arvidsson accomplished this in just 58 games. Colton Sissons potted an empty net goal, and then Nick Bonino added some salt in the wound with less than a minute remaining in regulation. 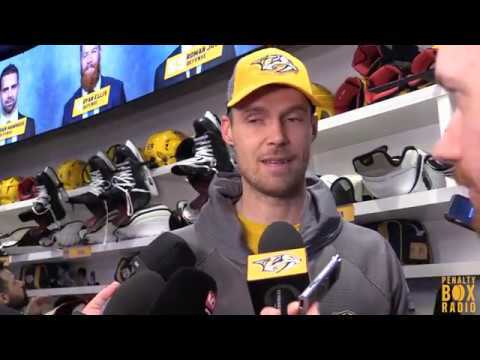 Hear from Viktor Arvidsson, Dante Fabbro, Roman Josi, Filip Forsberg and Peter Laviolette in the post game report. Update: Per John Shannon of Sportnet, Game 1 will be Wednesday night in Nashville.